"I have much, much better. Ninjas. Top-secret, Bond-san. This is my ninja training school." The one that only looks good from the point of view of vulgar auteurism. 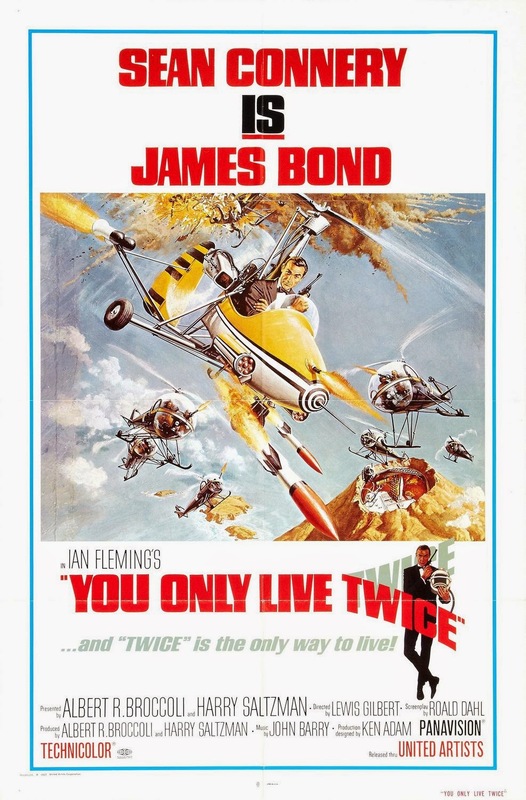 You Only Live Twice is the goofiest of the Bond movies until at least Moonraker (which was also directed by Lewis Gilbert), and even then I think it might give Roger Moore a run for his money. It's 007 with ninjas and spaceships. Technically, Bond and the ninjas never go into outer space (as if that makes the premise any less silly), but they do raid the volcano being used as a launching platform for the spaceships. MI6 is transplanted into an underwater submarine, which you know is a submarine because it looks exactly the same as MI6 always does with the exception that the doors all have metal frames. Bond is referred to as "Bond-san" and is given "years" of training to become a ninja, including cosmetic surgery to "make him Japanese"—all of which passes by in a few seconds of montage. And yet, as crazy as all of that sounds (and it is), it's hard to deny that some of it works, up to a certain point. It's a Bond film in name only (i.e. the same characters in an entirely foreign universe), but the fact that it's not like anything that's come before gives it a unique and chaotic energy. Some of it is really fun in a way that the movies more concerned with keeping Bond serious (e.g. Thunderball) could never achieve. Even Little Nellie, Q Branch's heavily armed one-man mini-helicopter, feels like an invention which couldn't exist in any of the other movies. It's awesome, and I wanted more than anything to have my own when I was a kid, but it's also so fantastically unrealistic that it doesn't seem to have a place in the rest of the series. 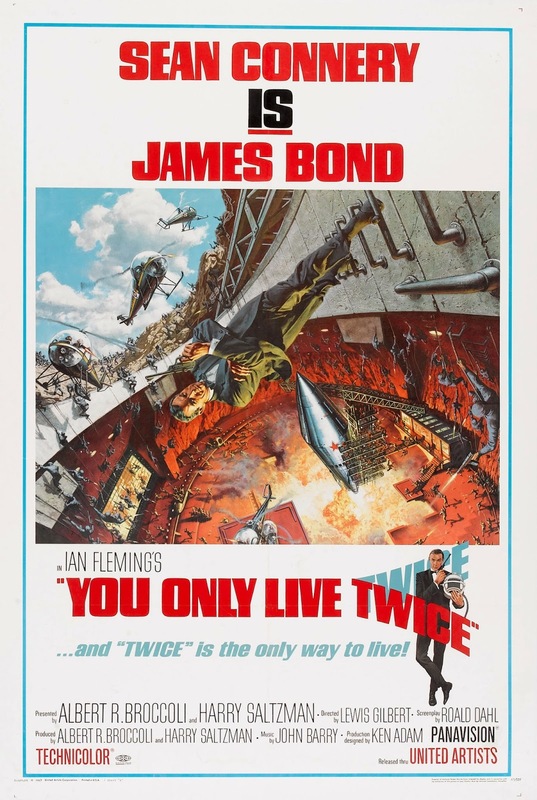 As much as I wanted to take You Only Live Twice on its own ridiculous terms, some of it is so awful that it makes me less willing to forgive the more minor flaws. The story is laughably plotted, the effects and rear projection look painfully fake, and everyone seems to have forgotten how to act—but all this would be acceptable, however, if the film were at least an entertaining diversion. And the first half of it is, more or less; but once Bond starts turning Japanese, everything becomes a cringe-worthy extension of the series's fascination with exoticism. It's interesting to think that this is what other films like From Russia with Love have at their core (e.g. the gypsy fight), but that doesn't make it a better film. Still, it's not nearly bad enough to be worth skipping. The first half is fun in its own zany sort of way, and its inversion/extension of various Bond tropes provides a fascinating counterpoint to the rest of the series. It's worth one watch just to see how far from "normal Bond" the franchise can go, and maybe there's a schlock masterpiece in it somewhere, but for me it's something I'll struggle to find a reason to watch it again.